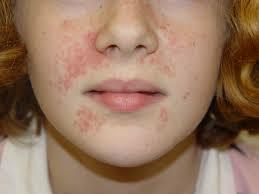 Perioral Eczema looks like acne and appears round the mouth, nostrils and lower face. The spots are red with white heads and there is often inflammation but rarely itching. It usually affects women between the ages of 20 and 45. It is not uncommon, and has a tendency to recur in individuals who have had it once. It is usually caused by the use of topical steroids, although it can have many other causes including fluoride toothpastes or simply continual irritation. It is made worse by cosmetics, soaps, facial washes and steroid creams so it's advisable not to use these on the affected area. Your doctor or dermatologist will probably stop the topical steroids or put you on to a less strong one and prescribe antibiotics or erythromycin, as used to treat acne. It can take several months of treatment to clear. Many sufferers find treating the affected area with a face mask using a paste of Sea-Med seaweed powder very effective. A DermaSilk Facial Mask, worn overnight, is recommended.